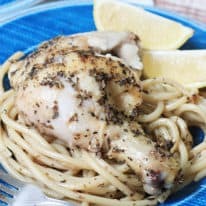 Greek Lemon Chicken seasoned with oregano, basil, garlic, and olive oil and served over pasta! 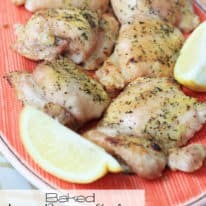 This amazing roasted Greek Lemon Chicken is just the recipe you need to change up your typical chicken dinner night at home. The seasonings for this dinner are a perfect blend of dried oregano, dried basil, salt, lemon pepper, minced garlic, and olive oil. 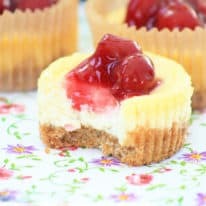 A drizzle of fresh lemon juice is the finishing touch! 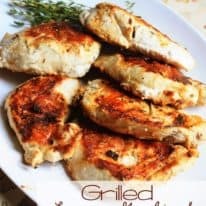 What kind of chicken is used in this recipe? You’ll need a 3 to 4-pound whole roaster-chicken from the fresh poultry department of your local grocery store. Be sure to remove the bag of giblets, usually inside the cavity of the chicken, and discard before cooking. 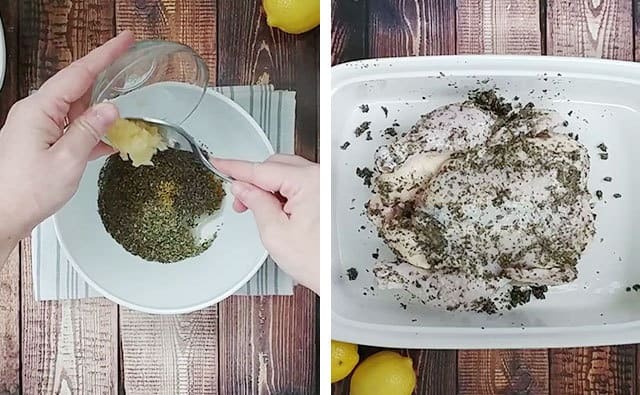 It also helps to pat the chicken dry on all sides with a paper towel to help the Greek seasoning rub stick to the chicken. 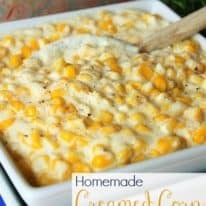 What type of pasta is used in this recipe? 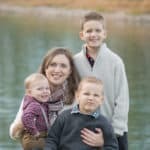 Any long, thin pasta works with this recipe: spaghetti, angel hair, linguine, or bucatini for example. In a small bowl, stir together oregano, basil, salt, lemon pepper, minced garlic, and olive oil. Spread over entire surface of chicken. Pierce a lemon and place inside the cavity of the roaster-chicken. 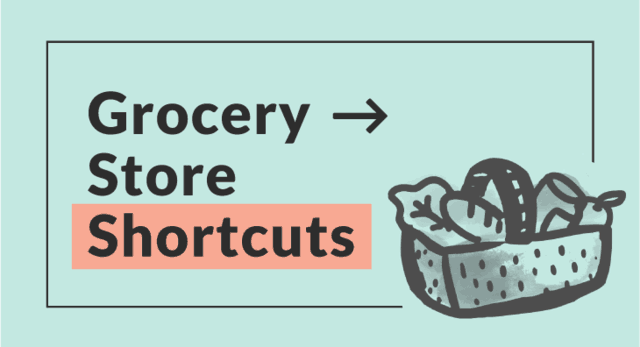 Slice the second lemon in half and squeeze both halves over the chicken, being sure to catch any seeds that may fall. Place the lemon halves along with the chicken in the baking dish. Pour 2 cups of chicken broth into the bottom of the baking dish. Bake the chicken at 350 degrees for 1 1/2 – 2 hours or until juices run clear and internal temperature reaches 165 degrees. Transfer chicken to a platter and cover tightly with foil. 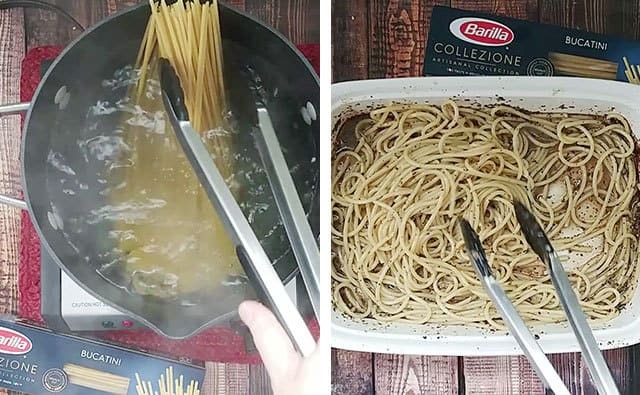 Prepare pasta in a pot of boiling water according to package directions. Drain pasta and place into baking dish. Using tongs, stir the pasta into the juices of the baking dish. Serve sliced chicken over top pasta with additional juices ladled over the top as desired. 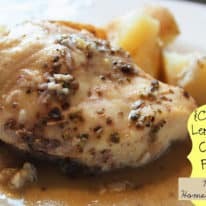 If you liked this recipe for Greek Lemon Chicken, please leave a rating and a comment below this post! 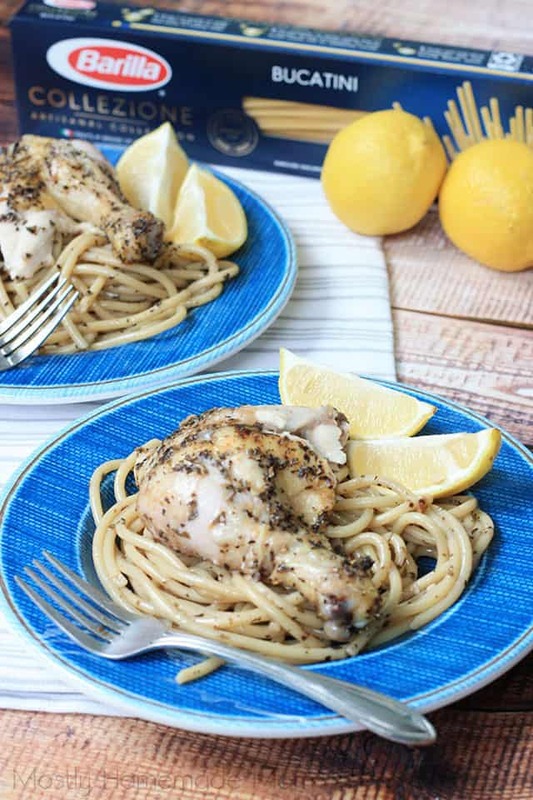 Greek Lemon Chicken recipe with roasted chicken, Greek seasonings, lemon, and Bucatini pasta. In a small bowl, stir together oregano, basil, salt, lemon pepper, garlic, and olive oil. Place chicken into a baking dish or roasting pan. Rub seasoning mixture all over the outside of the chicken, flipping it over to get the underside as well. Prick one lemon several times with a fork and place inside the cavity of the chicken. Halve the other lemon and squeeze both halves over the chicken, being sure to catch and remove any seeds that fall out. 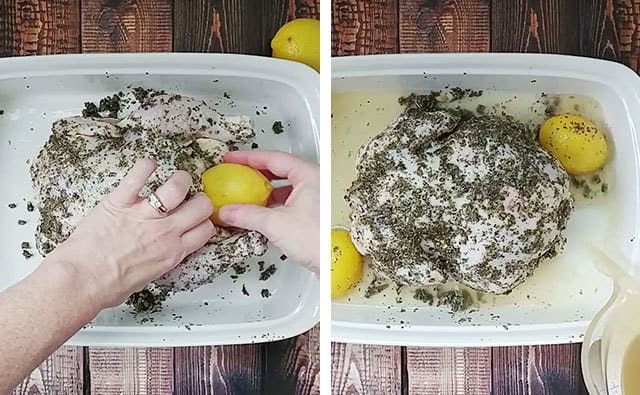 Put the lemon halves in the baking dish with the chicken. Pour the chicken broth into the baking dish. Bake chicken at 350 degrees for 1 1/2 - 2 hours or until internal temperature reaches 165 degrees. 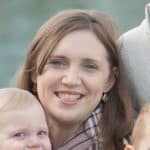 Remove dish from oven and cover with foil. Bring water in a stock pot to a rolling boil. Cook Bucatini in the boiling water until al dente, about 7 minutes. Drain and return to pot. Using tongs, transfer cooked pasta into the baking dish swirling it into the juices and seasonings to coat it well. 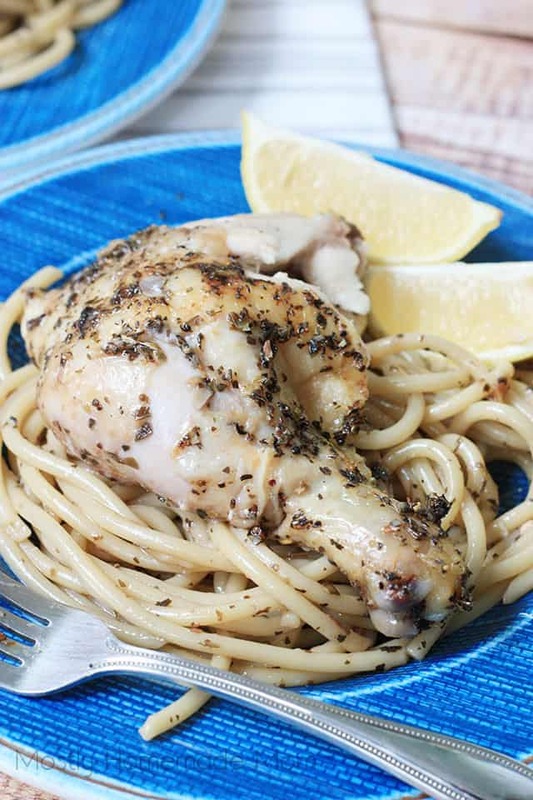 Serve pasta topped with slices of roasted Greek chicken. 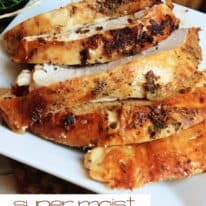 Such a different flavor – as someone who normally doesn’t care much for chicken, I could easily eat this again, which means 5-stars in my book.